Hookworms are ghastly little creatures. Tiny, parasitic, and frighteningly invasive, these wriggling hell-spawn consistently rank among leading causes of morbidity in underdeveloped nations, abound in regions of the world suffering from poor sanitation, and have been described by various epidemiologists as "the American murderer" and the "the great infection of mankind." But there's a twist; it turns out hookworms are also great for treating food allergies. And irritable bowel syndrome. And asthma. How does an organism that affects over one billion people worldwide, a parasite widely regarded as one of the worst infectious scourges of our time, actually benefit us? In 2004, a team of researchers at Trinity College Dublin decided to investigate whether infecting mice with parasitic worms would decrease their susceptibility to experimentally induced colitis, a nasty gastrointestinal illness. Incredibly, the treatment worked; infection with the parasite was shown to prevent onset of the disorder. Around the same time the Trinity College Dublin team was infecting mice with parasitic worms, University of Nottingham immunobiologist David Pritchard was doing the same to people, including himself. His goal? To reproduce in his own body an observation he'd first made in Papau, New Guinea almost two decades earlier. While conducting field work, Pritchard had noticed that Papuans infected with hookworms were generally unaffected by asthma, hay fever, and other auto-immune reactions — disorders that arise when an immune system commences friendly fire agains the body its sworn to protect. Pritchard and his team decided to investigate by analyzing stool samples taken from Papau villagers. Hookworms infect their host through the skin, travel to the heart and lungs via the blood stream, and are coughed up into the pharynx where they are subsequently swallowed. Upon reaching the small intestines, larvae mature into adults, grab hold of their host's guts and feast away on his or her blood, all the while laying eggs which are expelled in the feces. Someone comes into contact with the feces, and the cycle begins again. The researchers found that villagers with more fertile parasites had lower levels of allergy-related antibodies in their blood, suggesting the hookworms had found a way to nerf their hosts' immune responses. Since allergic response is tied to the body's immune system, it stood to reason that the absence of autoimmune disorders like asthma and hay fever could be attributed to the hookworms; the parasite's survival response was actually benefitting its host, in one of the most roundabout ways imaginable. "The allergic response evolved to help expel parasites, and we think the worms have found a way of switching off the immune system in order to survive," hypothesizes Pritchard in an interview with the New York Times. "That's why infected people have fewer allergic symptoms." And Pritchard's hypothesis has been holding water, both in his own experiments as well as others. Symptoms from autoimmune disorders ranging from asthma to Crohn's disease have been shown to be noticeably reduced in study volunteers administered "safe doses" of hookworm therapy. Clinical trials that use hookworms to treat Multiple Sclerosis are slated to begin later this year. 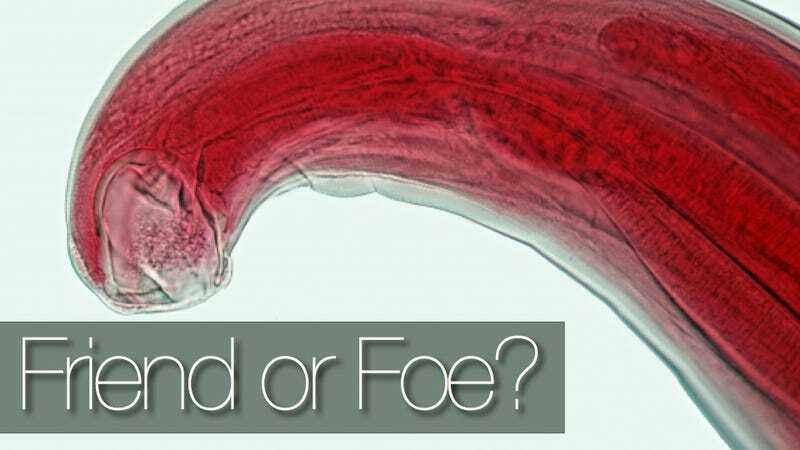 By improving our understanding of hookworms in general, researchers hope to continue shedding light on their therapeutic potential. Tropical disease expert Dr. James Logan recently infected himself with hookworms in the interest of helping researchers study, in greater detail than ever before, the mechanisms at play in the infection process, and to test associations between the parasites and food allergies. UK television show Embarrassing Bodies documented the 2-month experiment, a clip of which is featured here. "The challenge for those of us using necessarily lower levels of worm infection in humans is to mimic the positive effects seen in animal models using alternative and inherently safe strategies," writes Pritchard in a recent perspective on the potential benefits of hookworm infection, "such as boosting with low-level ‘trickle infection', as is likely to occur in the tropics [where hookworm infection is especially common]." "This will be an interesting immunological journey, and early indications suggest that therapeutic dosing regimes can be developed."